Inspired by tree branches, the Branch small outdoor tables look fluid and organic. Behind the airy, slimline appearance lies a sophisticated design and well thought-out materials. The aluminium die-cast frame is powdercoated with a double layer for a superior scratch and uv-resistance. Aluminium is an excellent outdoor material, easy to clean, weather-resistant and 100% recyclable. The Branch contract table is available as a round bistro table or as a square model. Both are ideal as small balcony tables. Bistro table square available with aluminium, granite or teak top. Bistro table round available with aluminium, granite or teak top. Low table rectangular available with aluminium, granite or teak top. 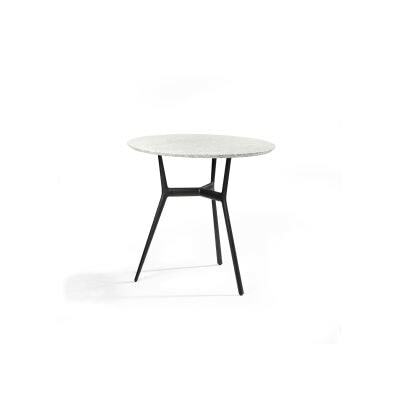 Low table round available with concrete (linen or wenge), granite or teak top.